Gluten-free bread recipes are the holy grail of gluten-free baking. It’s within reach, when you have the right gluten-free bread recipe. And once you’ve read up on my Top 10 Secrets To Making Good Gluten-Free Bread. But what about once you’ve made it, and you want to use it to make your family’s back-to-school lunches—How do you store that homemade gluten free bread? Here are the 10 rules to live by. 1. When it’s first baked, store homemade gluten free bread it in a breadbox. And make sure the bread has enough empty space around it that air can circulate around it. A closed breadbox retains some moisture in the box, so the bread doesn’t dry out, but doesn’t hold it so close to the bread that it makes it soggy. 2. Never store homemade gluten free bread in a sealed plastic bag at room temperature. The moisture in the bread will condense and cling to the bread, making it terribly soggy. 3. Never store homemade gluten free bread in a paper bag. The paper bag will itself become moist from humidity in the surrounding air, and your bread will become soggy. 4. 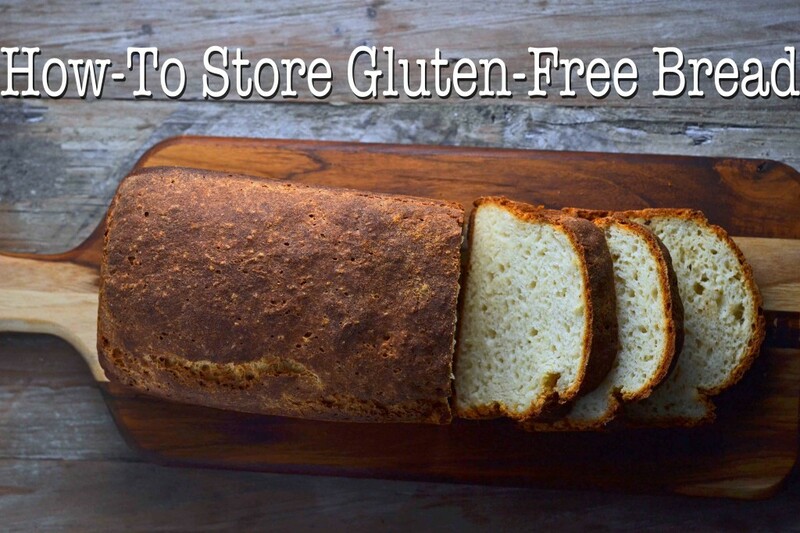 Never store gluten free bread in the refrigerator (homemade or store-bought). The refrigerator is designed to keep moisture at bay, as moisture tends to spoil food. Storing bread in the refrigerator will dry out your bread in a hurry. 5. Store leftover gluten free bread that is older than 3 to 4 days (depending upon humidity levels in your kitchen) in the freezer. To prevent freezer burn due to loss of moisture, first wrap bread tightly in a freezer-safe wrap. I really like Glad Press’n Seal freezer wrap. It is sturdy and clings tight to whatever you wrap in it. 6. If you don’t expect to use all of the frozen gluten free bread at once, consider slicing it before wrapping and freezing it. That way, you should be able to defrost just what you need without compromising the rest of the loaf. 7. Cool homemade gluten free bread completely before placing it in a breadbox or other container, and before freezing it. Otherwise, the moisture in the bread that would have evaporated upon cooling will instead condense and ruin any hope of crispness. 8. Never slice into homemade GF bread before it is completely cool. It won’t hold its shape, so you won’t get a clean slice. It’s so hard to wait. Try try and try again. 9. Leave a fresh loaf of homemade GF bread whole, unsliced, until you are ready to use it. The crust will help keep the bread from going stale. 10. Once you have sliced into a loaf of homemade GF bread, when you store it in a breadbox, store it with the cut side down, to minimize staleness. P.S. If you haven’t yet, please pick up a copy of My Cookbook! I can’t keep the blog going without your support!